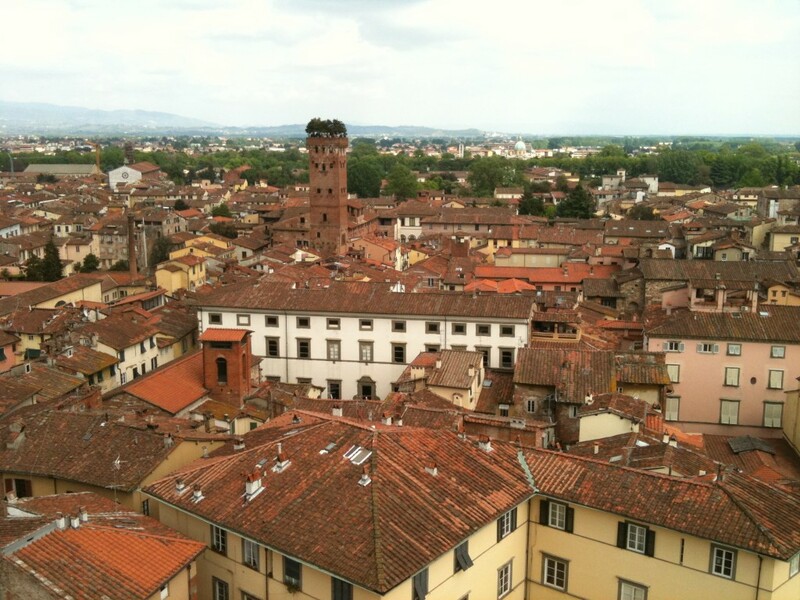 On top of the walls surrounding Lucca. Lucca is absolutely gorgeous, a complete gem in the Tuscan countryside. In many ways it is our ideal town. The town walls are largely intact and a wide pathway sits atop them as they fold around the old town. We walked the 4km circumnavigation this morning, under sweeping green trees and surrounded by people on bikes, others strolling, kids running. On the bastions, tables and chairs are set up and locals sit playing dominos or enjoying a coffee in the sun. Looking inwards there are white and yellow houses surmounted by red roofs. Looking outwards there are forests of tress against the backdrop of rolling green hills that form the valley in which Lucca sits. 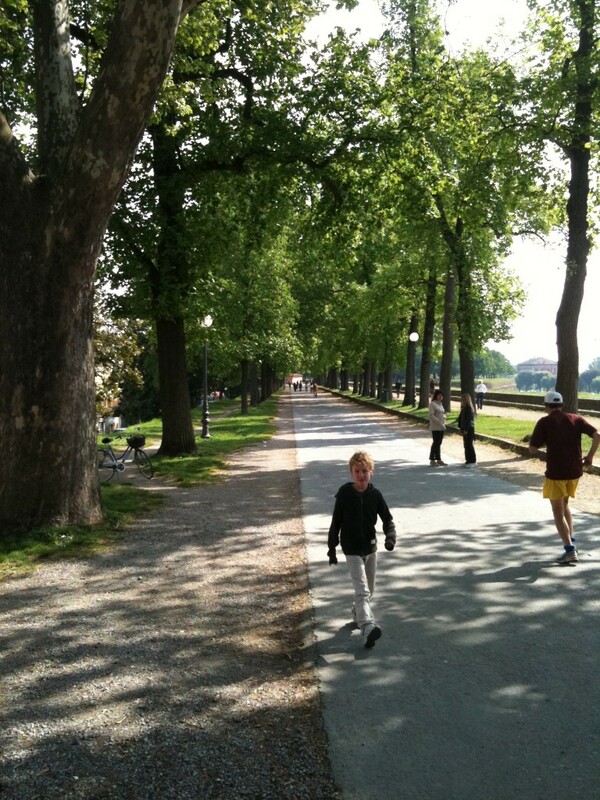 Within the walls, most of Lucca is pedestrian and people stroll over the wide grey paving stones past stylish shops. The 15th Century houses stand tall and give the streets a wonderful old-fashioned look. There are cafes everywhere and people, perhaps especially on an Easter Sunday, sit and watch the world go by. 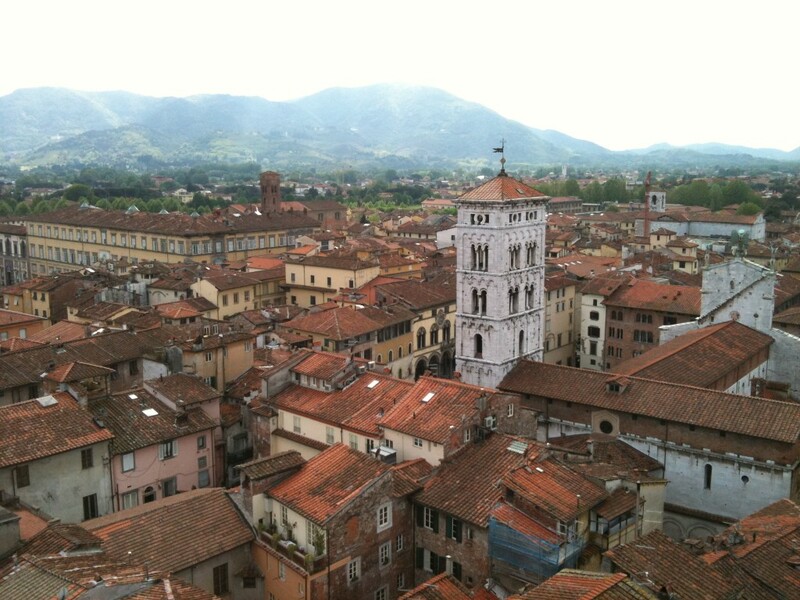 Looking at the Guinigi Tower from the Tower del Orro.. Tall towers stretch up from the sea of red-tiled roofs. The towers were built in the Renaissance both as functional defence and a status symbol. There are enough of them left in Lucca to give an idea of what the place must have looked like in its heyday. We climbed a couple of the towers, including the Guinigi Tower which is surmounted by seven live oak trees, for a wonderful view. Geting water like the locals. This evening we had dinner in an outdoor cafe in Piazza Antelminelli. 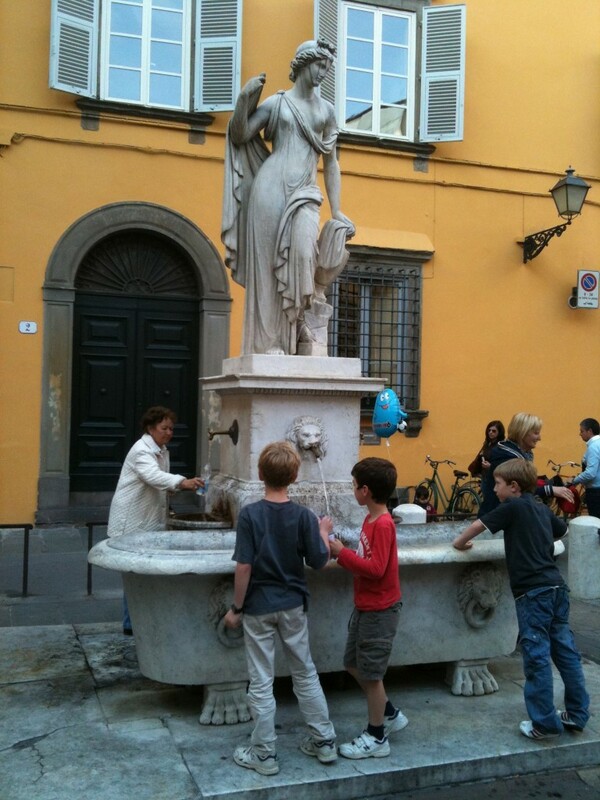 We sat and watched the locals filling up water bottles with spring water from a fountain beneath a lovely statue. 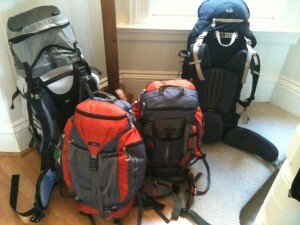 People would come in on bikes or on foot, fill up bottles while chatting and then gently head on home. As the shadows lengthened Jennifer and I sat nursing beers while the kids ran around the piazza in this lovely Tuscan town. We breathed a number of sighs of contentment and agreed that this was our new favourite place. We love Lucca too! It’s nice and digestible, really pretty and unspoilt.